I can't tell you how excited I am about this little kitchen makeover. Ever since I found I was pregnant with our little girl, I knew I wanted to make her a play kitchen. I have had so much fun making them in the past for other people. So I set out on a hunt for the perfect nightstands, or better yet a pair of nightstands. Let me tell you, that is no easy feat, especially if you don't want to spend a fortune. Then I came across this little gem at Goodwill for $10. It was too good to pass up. Nice right? It looks like maybe it was kept outside on a porch or something based on all the dirt that was on it. There was also some damage to the MDF from water or something. So I scrubbed the entire thing down really well and then primed it with Kilz Spray Primer. I did a few coats because I wanted to make sure I had really good coverage and adhesion. Once it was dry, I sanded everything down with fine grit sandpaper to make sure it was smooth. Then I spray painted it all glossy white. I used this spray paint. A lot of the accent pieces got a coat of gold spray paint, because I love it. For the countertops, the kind people at designyourwall.com offered to let me try out some of their contact paper. I wanted to paint a faux marble looking countertop, but wasn't sure I could pull it off. I also thought the contact paper would be a nice option since it would be wipeable and wear well. I went with the Marble Carrara Grey. You guys when I got it in the mail I was so impressed! I couldn't believe how much it looked like real marble. I'll admit I was skeptical before I got it. I had only seen the cheap faux marble contact paper that you buy at Walmart and wasn't expecting much more. This stuff looks like the real deal! 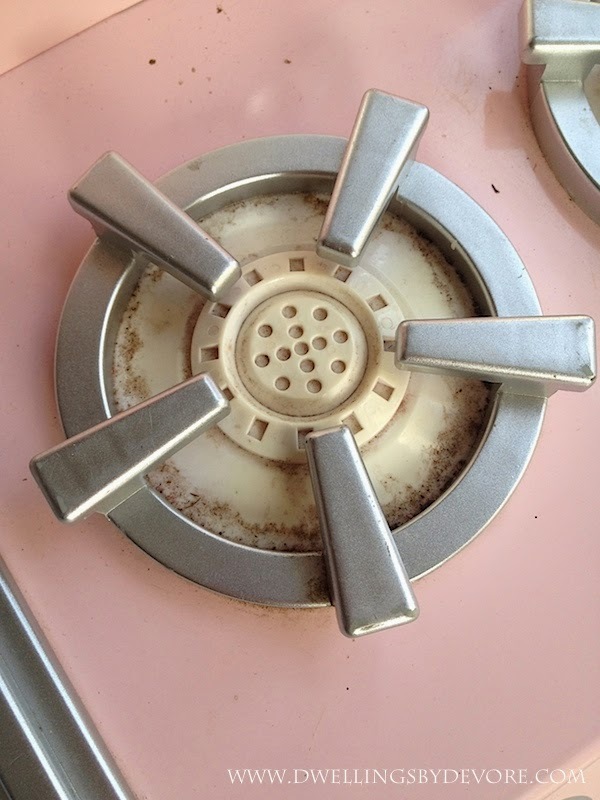 It's a great solution for a backsplash for renters because it peels off without leaving residue. If I didn't have green laminate countertops in my kitchen I would definitely be trying it! 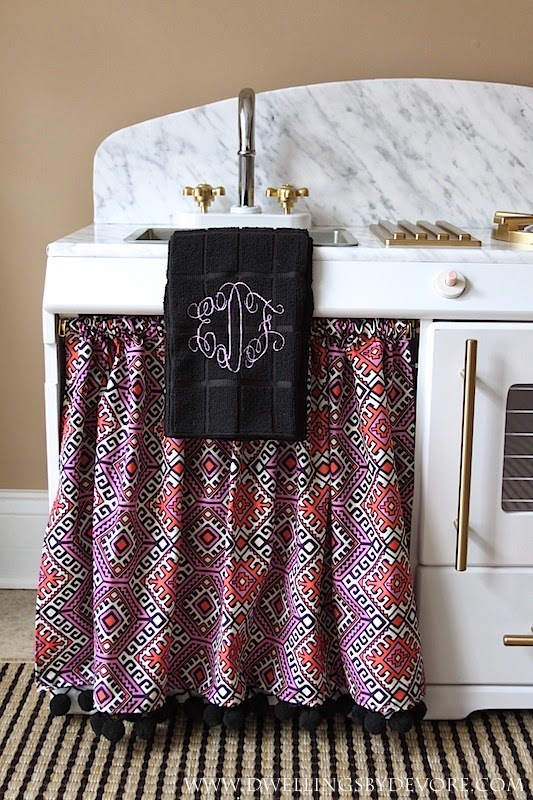 I can't resist pom pom trim, so I added a little to the bottom of the skirt. Speaking of the skirt, there was a door there originally but it didn't close correctly. You had to lift it to get it to stay and I knew it would just be frustrating. 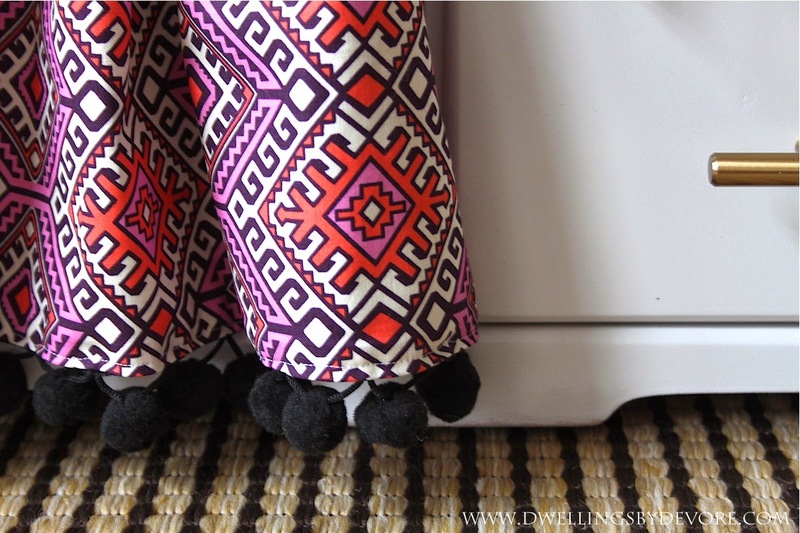 I liked the idea of adding fabric anyway to give it more color and pattern. 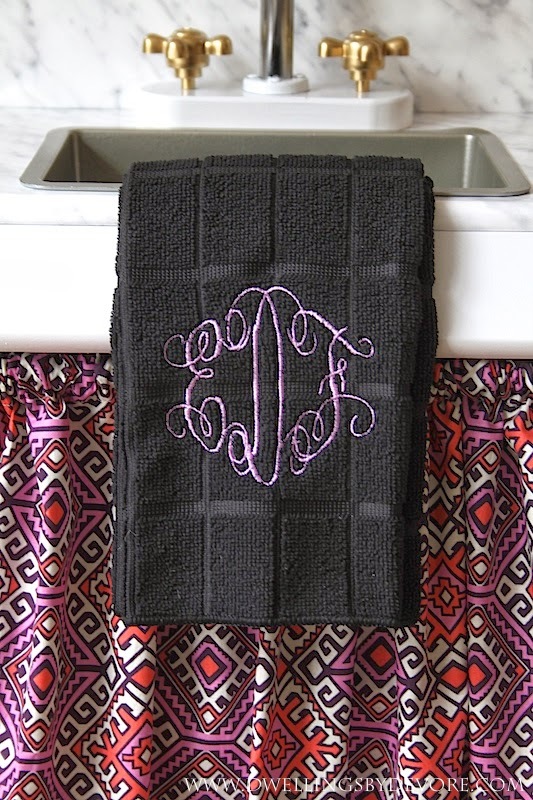 I'm a true southern girl at heart, so I jump at the chance to monogram anything! In fact, I think I need to make one of these for my own kitchen! She loves it and spends most of her waking hours playing with it so I think it was a success! In fact, I think this just might be my dream kitchen on a smaller scale! You are killing me! This is so not what I expected and just so stinking adorable! Now I want to get mine out from the attic even though my daughter is too big for it already. oh my lord that is amazing!!!!!! WOW!!!!! 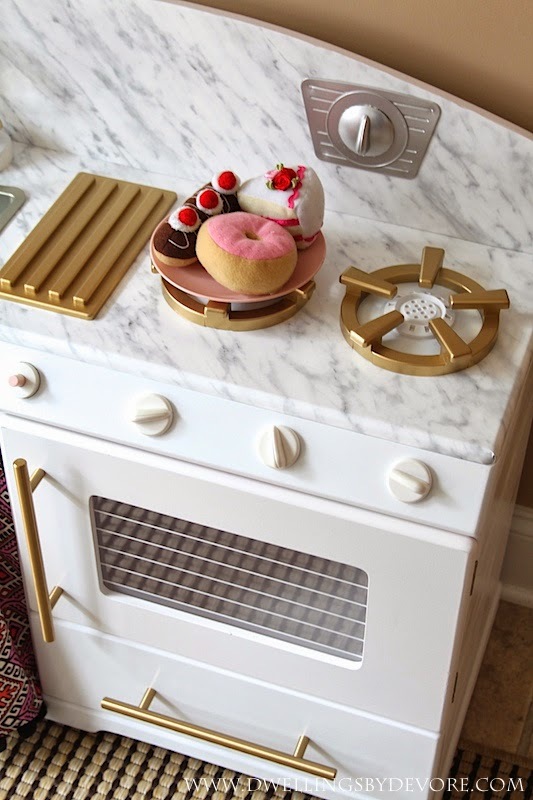 This mini kitchen is giving me tons of inspiration for my big girl kitchen! Oh my god Bethany that is frigging amazing. 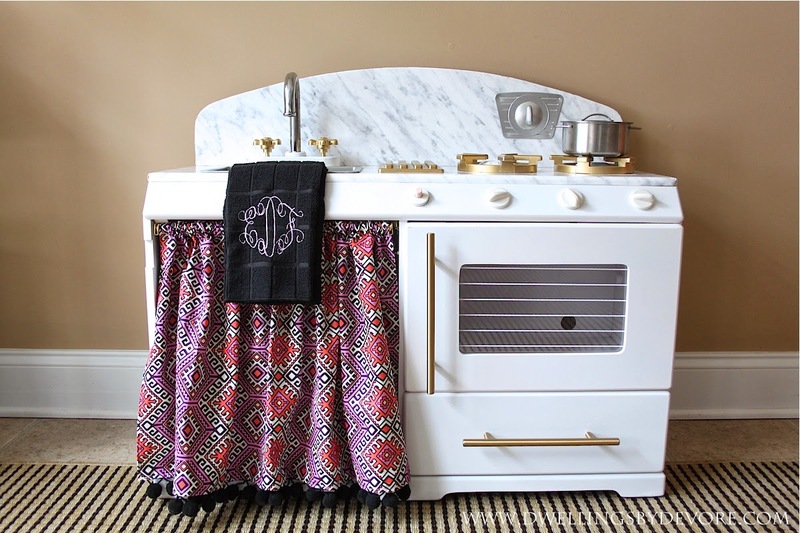 I can't wait to have little one(s) so I can revamp tiny kitchens - let alone a real kitchen! 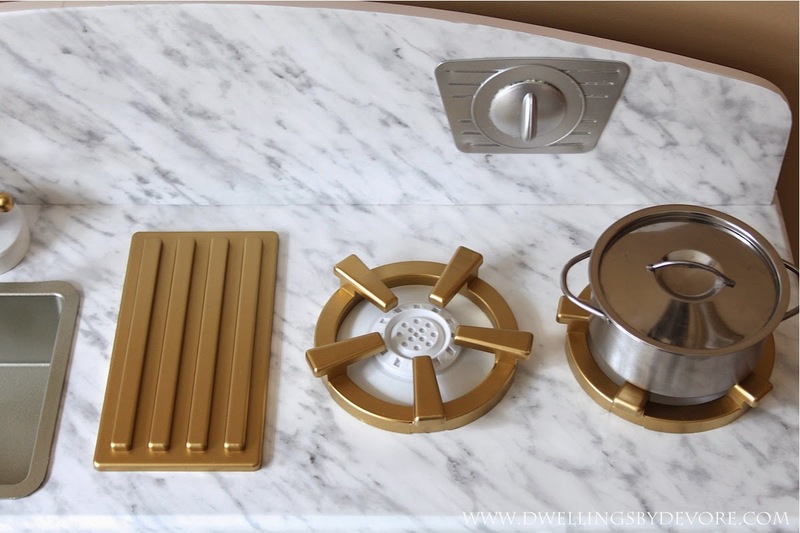 This is totally my dream kitchen in miniature! You did such a stellar job (what a great thrifty score), I love it!! That contact paper is the best marble look I've ever seen. Quinn has the IKEA play kitchen & you've inspired me to tweak it! I cannot get over how much I love this! It's UH-MAZING!!!! You are so stinkin' talented! the chic-est play kitchen I've ever seen Bethany! Fantastic! 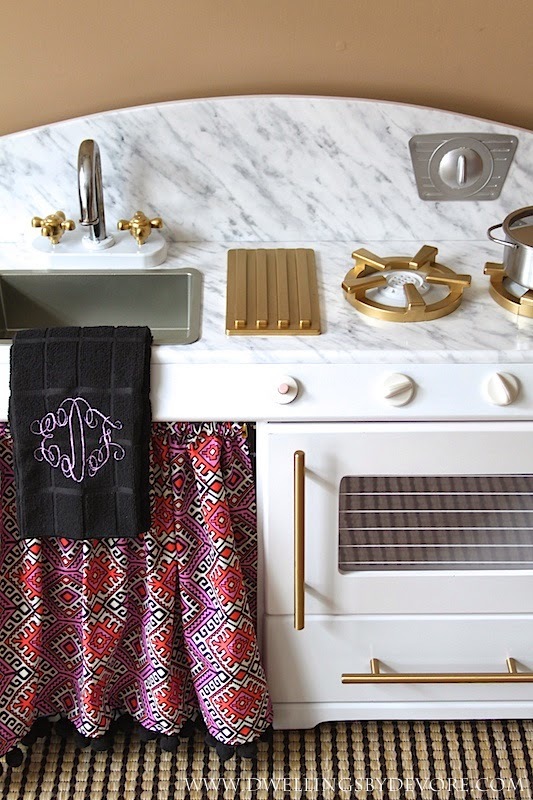 I've also used marbled contact paper in my own kitchen! oh my how adorable you did an fantastic job on it!!!!! This is the most adorable little kitchen I have ever seen. Now I must get my hands on some of that contact paper. OMG Bethany, I love it!! Its nicer than my own kitchen. :) So well done! 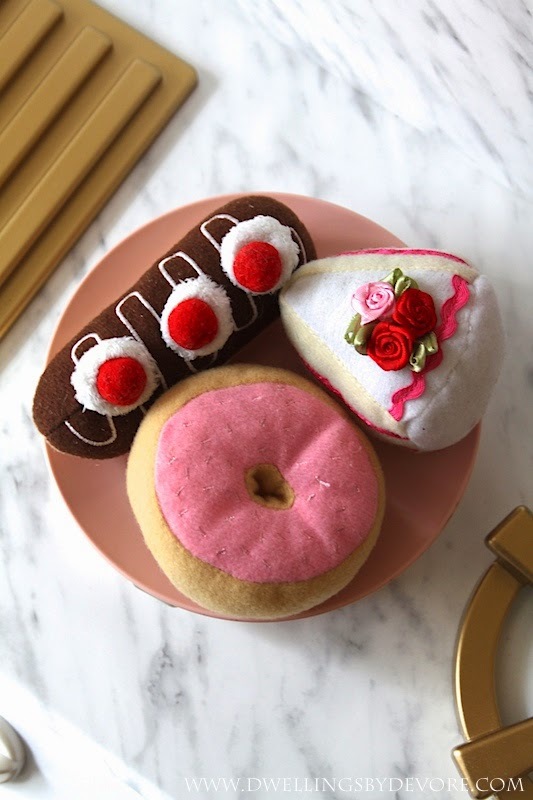 this is perhaps the cutest diy i've ever seen. such a wonderful job! that contact paper looks amazing. 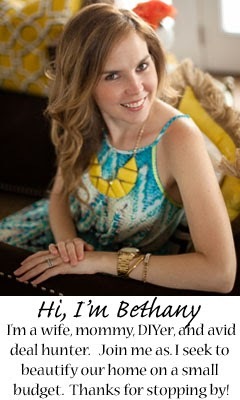 Bethany!!! This is outrageously gorgeous. Every detail, every part of it, is just fantastic. 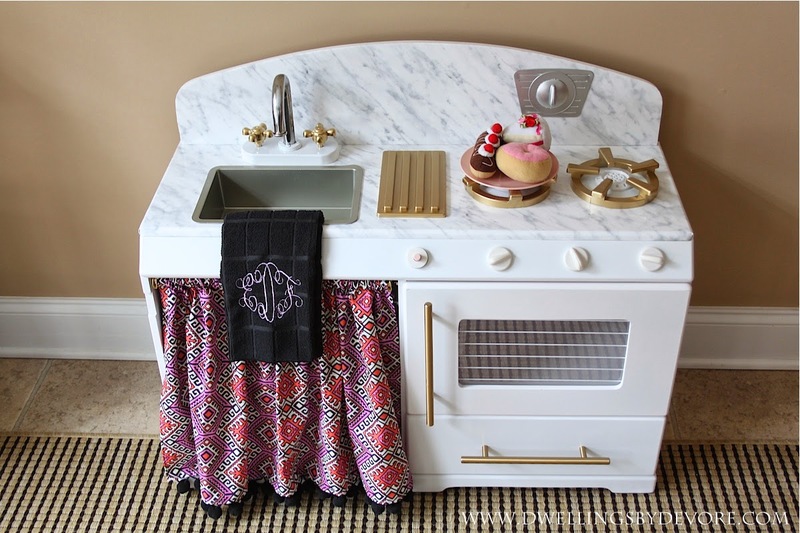 There have been a lot of adorable play kitchens done, but none even come close to this beauty. I have never wanted to be young again so badly. Or thought I would be tempted to use a play kitchen as inspiration for our own kitchen update. ;) You have done such an incredible job, I just adore every last detail! That is possibly the cutest thing I have ever seen! Why did I use the ugly plastic stuff when my girls were little when i could have done something as fun as this?! Umm all I can say is WOW!!!! I adore that you made the counter and splash marble. 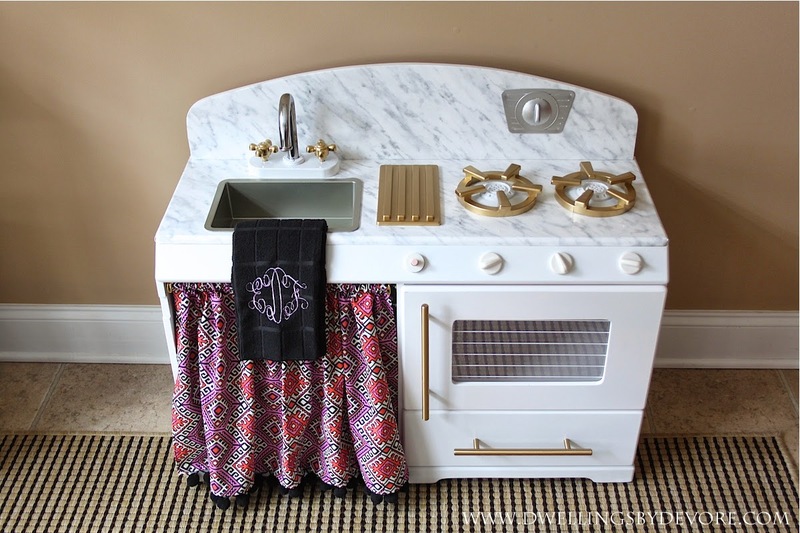 This is BY FAR the chicest play kitchen I've ever seen. Your little girl is so lucky to have such a creative mama!! looks FABULOUS! the contact paper looks amazing too- you don't think you could put it on your laminate counters? Oh my word! 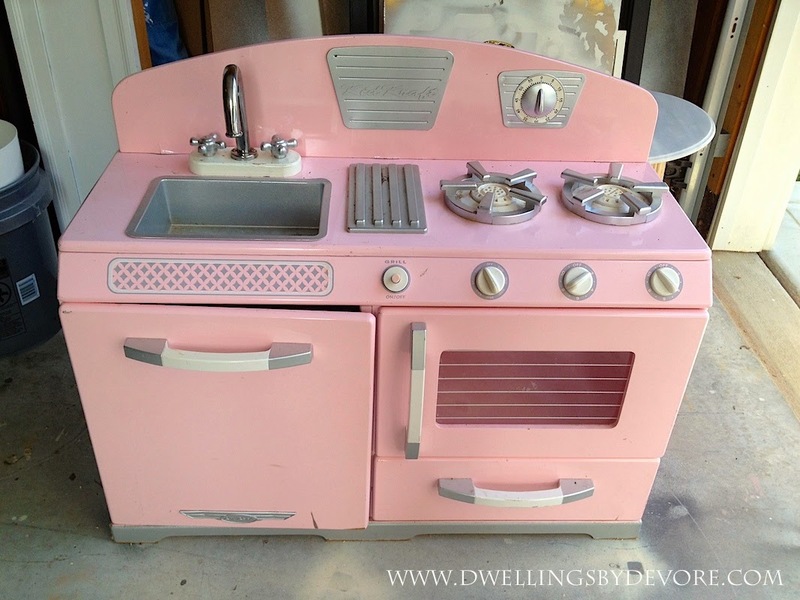 This is the cutest play kitchen I have ever seen! omg this is the best play kitchen ever? Thank you! The adhesive on the back isn't super sticky, which is nice so you can reposition it. But I think that would make it not adhere very well to laminate countertops. I'm not sure it would hold up super well either, especially since we are kind of hard on our counters. It looks so cute! I just ordered the marble contact paper for a little project I am working on. I hope my project turns out as cute as yours did! Thanks so much! I love that marble contact paper, great for so many things!